For the uninitiated, a microadventure is the brainchild of Alistair Humphreys, and involves getting away from it all and sleeping out under the stars. The idea is that you can fit an adventure in the 5-9, the hours you aren’t working midweek. All the equipment you need is a sleeping bag, bivi bag (waterproof cover) and sleep mat. It is simplicity itself, and you need go no further than your nearest hill for a night of relaxation among the elements. So when a friend invited me to join him for a first microadventure I didn’t hesitate. The plan was simple enough, if not strictly as Alistair recommends. Walk the 55 miles of the Wysis Way over a weekend stopping up a hill for a night out, sleeping al fresco. So I packed a bag, grabbed some snacks, a guide book and hit the road. And that’s pretty much where it started to go wrong. The Wysis Way is a long distance path linking the rivers Wye in Monmouth and Isis (the ancient name for the Thames) at it’s source near Kemble, Gloucestershire. What this means is it doesn’t actually follow anything of interest or handrail any obvious landmarks or link castles, offer continually spectacular views, have an exciting history or anything else entertaining. 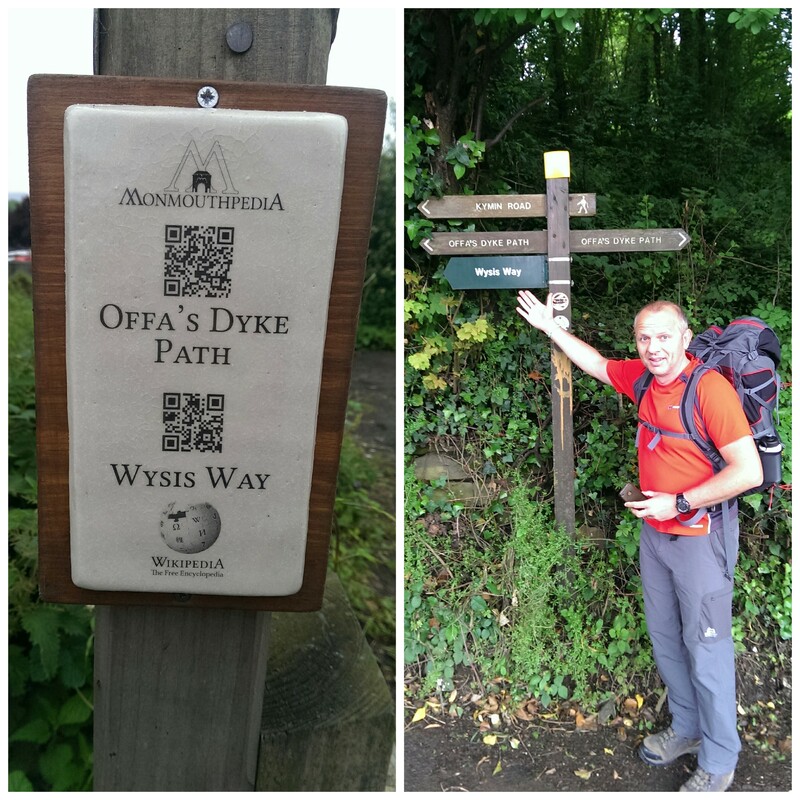 We were only to learn this after the first few miles, but what we learned from the start is that the Wysis Way is muddy. Very, very muddy. In fact it would give Mudrunner nightmares and make Tough Mudder leave a different kind of brown stain. Parts of the route had even been used for the legendary (locally anyway) May Hill Massacre, a race that prides itself on the amount of mud it offers. In fact, the only place the path wasn’t muddy was when it became a stream, a 12″ deep, fast flowing stream with banks of nettle and thorn that offered no alternative. So that’s a dull walk along a muddy path, it doesn’t get worse than that…does it? Well yes, when the path is so badly signposted that navigation is a necessity every 200 yards it can start to become a little tiresome. Even the signs we did find had a tendency to be either pointing the wrong way (resulting in a comedy “get orf me land” moment) or not even attached to the floor! 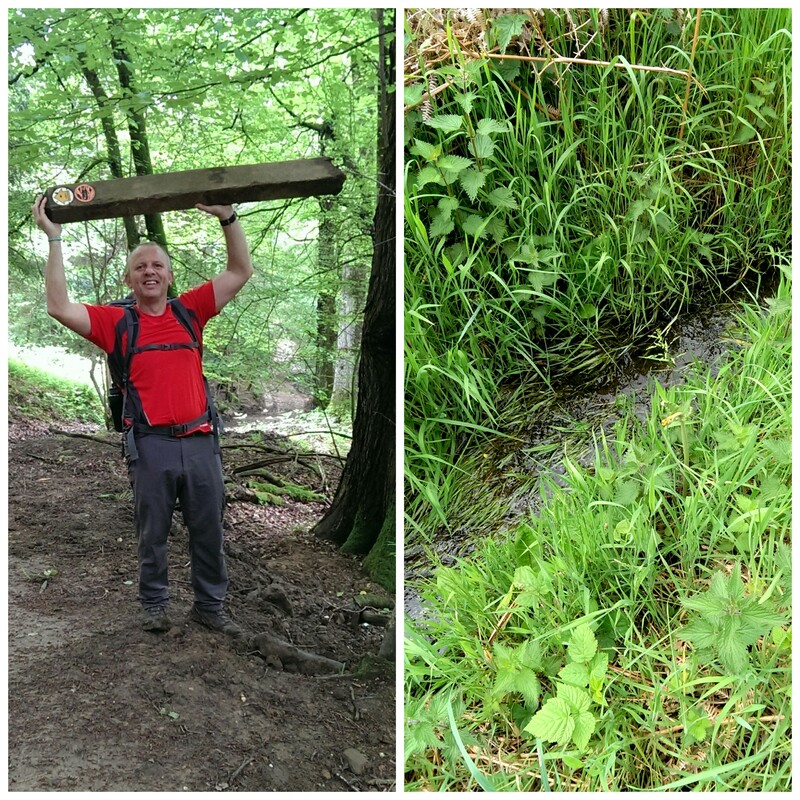 It was only through a combination of guide book, OS map and navigation app that we were able to locate the path at all on a number of occasions (and do our best to correct the signage!). “Which way do you want this arrow to point?” isn’t what you want to hear, and a stream isn’t what you want to see! I should point out here that it is only with hindsight I can see how bad this trail was for walking (and how poorly prepared we were for its demands) because at the time I was thoroughly enjoying myself! Slipping all over the place, wading through streams, confidently naming the different trees (turns out if you say “sycamore” confidently enough no one is going to argue with you, no matter how poor your knowledge of flora!) and all with great company putting the world to rights and planning our future careers as charity superheroes . But the upshot of all this adversity was that as the shadows lengthened and the day left us we’d covered around two thirds of the distance planned…and then the cows happened. I’ve shared fields with cows before, never bothered me. I’ve confidently stridden through the herd or done that thing where you get big (arms out, waving a jacket) and shout nonsense to drive the cattle away. Unfortunately the herd we encountered were very young, and hadn’t quite learned the rules yet. They seemed to think it was acceptable to chase us across a field, and although they stopped when I shouted at them thought it was good fun to start again the second I turned my back to head for the stile. They were smart too, possibly having read Sun Tzu’s The Art Of War. They definitely understood the tactics of a pincer movement and outflanking the opposition. Result? Karl and I sprinting the last 40 metres and diving head first over a barbwire fence on the wrong edge of the field and now the wrong side of a stream with an extra mile of walking across fields to find a crossing. Much like the cows the day had got behind us and we had an hour of daylight left by now. Having only covered 25 of the planned 33 miles we were still an hour from the nearest pub serving food, which would leave us almost in Gloucester city centre and not on the hills beyond as we’d planned. We were tired, sore, wet…and five minutes from where we’d left the car. Cow bastards, disappointing stats and a consoling pint, not how the day was supposed to end! I’ve just ordered Al Humphrey’s book “Microadventures” in an effort to avoid making the same mistakes again, and we have already agreed the location of our next attempt at microadventuring. 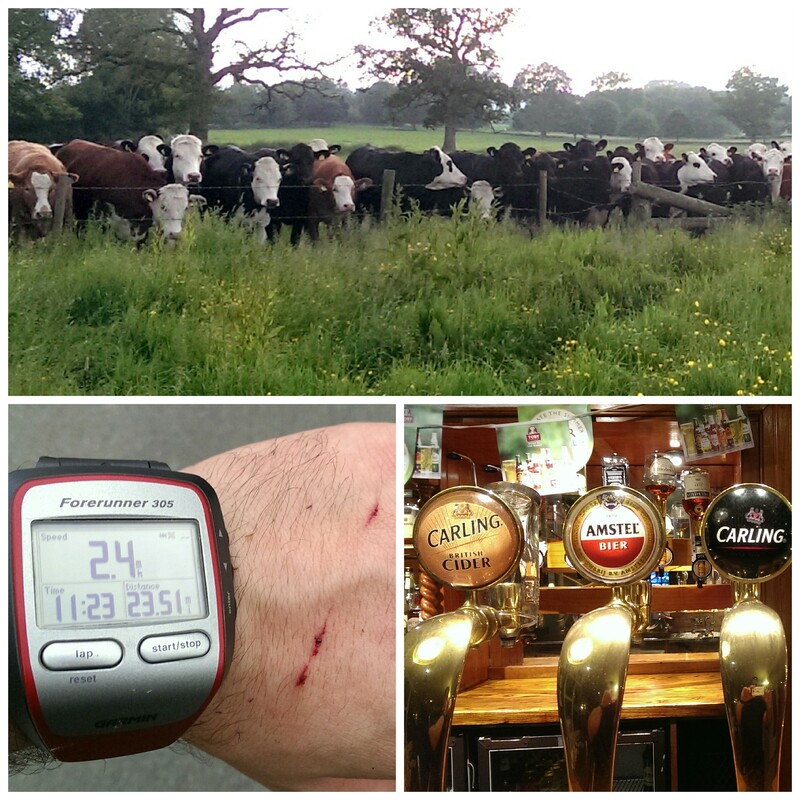 This entry was posted in Life, Training, Uncategorized and tagged adventure, cows, long distance path, micoradventure, thames, walk, walking, wye, wysis way. Bookmark the permalink. Thanks James, this made me laugh! You’ve got to watch out for cows these days they’ve turned nasty in recent years, not like how cows used to be when we were young! Thanks. It may not have gone to plan but we couldn’t have planned a better day! No, definitely an adventure, even if it wasn’t the one we expected to have! Certainly won’t forget it in a hurry. Sounds a brilliant adventure … despite the sneaky ninja cows and lack of attached signposts! And good plan to retire to the pub. The pub is almost always a good plan! Signposts you can point where you want though, not such a great idea! Cows are smart, and you’re right, they’re on the brink of taking over.